May. 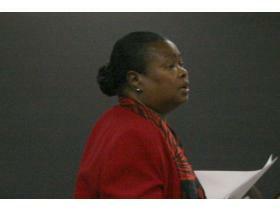 16, 2009 · 11:05 p.m.
Dr. Doris Hope-Jackson, superintendent for Willow Run Community Schools, announced today she will be submitting her resignation next week. In an e-mail sent to the Citizen this afternoon, Jackson said she will place the item on the agenda for the Board of Education to consider at its meeting Thursday. She said she made the announcement at the close of the second strategic planning session this afternoon. A first e-mail was sent to the Citizen at 2:21 p.m., which stated she would be submitting her resignation at the June 4 board work session. A second e-mail, sent more than an hour later, she stated she would be submitting it Thursday instead. “I have searched my soul,” Jackson said in the second e-mail. Jackson was hired by the board in 2007 to replace out-going superintendent Ron Ciranna. She is in the second year of a three-year contract. A reply was sent to Jackson’s e-mail, asking for a follow up. Stay with the Ypsilanti Citizen for more information on this developing story.